What is a Radical Sign or Symbol? As you progress into Algebra 2, you will be working more extensively with radicals. It's important to understand the radial sign and how radicals are used in math. I've designed many lessons to help you fully understand radicals. To see the entire list, click here. If you are just beginning, continue on this page to learn the basics about radical signs and symbols. Sometimes you will see the radical sign with a small number outside of the "v" part. This number is called the index. Other times you will see the radical sign without the index. When there is no index, it is always assumed to be "2", which indicates the "square root" of a number. There will always be a number or an expression under the radical sign. This number or expression is called the radicand. Why Do We Have Radicals? You know that addition and subtraction are opposite operations. These operations "undo" each other. 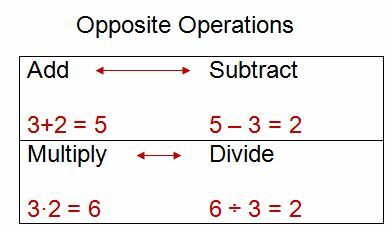 Multiplication and division are also opposites. When we solve equations, we use division to solve a multiplication equation. 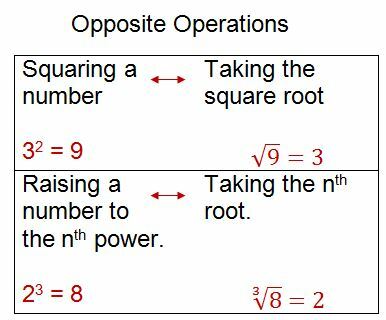 Well, when we square a number or raise a number to a power, we must also have an opposite operation. So, the opposite of raising a number to the nth power is taking the nth root. This is just the beginning - the basics! We will dive much deeper into how to simplify square roots and radicals and how to solve radical equations. The table of contents below is a list of all radical lessons. Click on the lesson that you are ready to study. If you are looking for even more in-depth instruction and video tutorials, please check out my extensive Algebra 1 and Algebra 2 E-course. Please note: I am just beginning to create the following pages. If there is no link to the page, please be patient, as I will be adding these links as each page is complete. Thank you!! I hope this helps in your study of radicals. Best of luck to you!